ROCKFON ceiling systems help students, teachers and staff benefit from optimized acoustics, healthy and safe indoor environments, sustainability and aesthetics. "Education Spaces – Ceiling solutions for a better way to learn" shares new lessons in designing effective school, college and university interiors. The new 16-page publication is available free for download at www.rockfon.com (PDF). "Many students are now spending more time at school and this affects the way we design and build for education. It forces us to innovate by using building materials that tackle specific challenges, such as noise, indoor air quality, fire safety and lighting. ROCKFON stone wool ceiling products can help balance between quality, performance and value," says Chris Marshall, ROCKFON vice president of marketing. "For educational facilities' design, functionality usually tops aesthetics. But both are possible and both have an important impact on students' progress through the academic year," adds Marshall. "For example, color can affect how we process information. Yellow is associated with creativity and blue with better concentration." Students' concentration and understanding their lessons also has a deep connection with their ability to hear their instructors. "Creating a good acoustic experience improves learning and understanding. Every student should have the same opportunity to hear and understand what is being said. Due to its fiber structure, stone wool is one of those high-performing, sound-absorptive materials. It provides ROCKFON ceilings, baffles and islands with excellent noise reduction capabilities," explains ROCKFON acoustic specialist Gary Madaras. 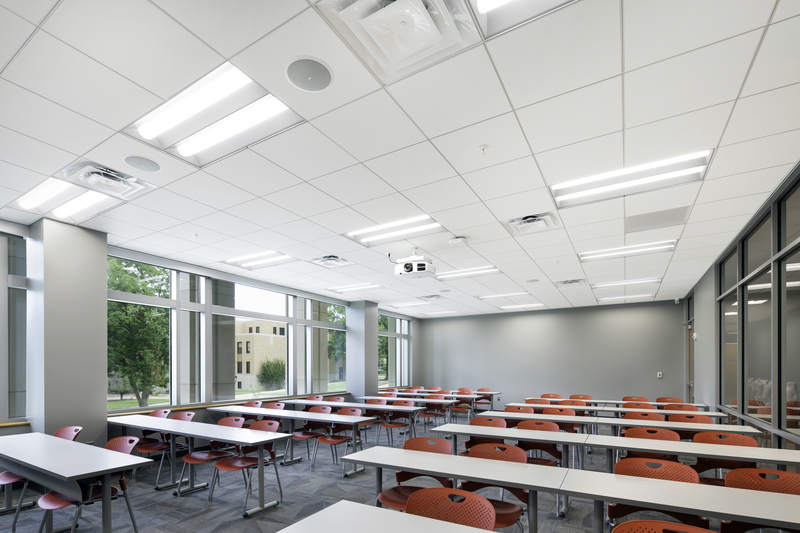 Marshall continues, "ROCKFON ceilings provide a great line of defense against indoor health hazards and support the newest educational building codes and regulations. Our ROCKFON stone wool ceiling panels are resistant to mold, bacteria and humidity, and are GreenGuard® Gold Certified for low VOCs. This stringent certification process considers safety factors that may impact people who are more vulnerable, such as children and seniors." In addition to referencing GreenGuard Gold certification, the U.S. Green Building Council's LEED® ratings also promote the advantages of daylighting for sustainable buildings. The white surface of ROCKFON ceilings can reflect up to 86 percent of available light. This better distribution of natural light helps educational facilities to lower electric lighting loads and reduce cooling costs, saving both energy and associated costs. In addition to describing how to address the challenges of aesthetics, noise, indoor air quality, sustainability and lighting, "Education Spaces" presents facts, statistics and inspirational examples. The publication features a case study on Arkansas State University's Humanities and Social Services building and showcases images of educational interiors from campuses around the globe. Learn more about these ROCKFON ceiling systems in "Education Spaces – Ceiling solutions for a better way to learn." Product guides and data sheets, specification and installation guidelines, and project examples also are available at http://www.rockfon.com. For additional support, please email cs@rockfon.com or call 800-323-7164.